CAAC often co-sponsors performances or collaborates with other presenting organizations. We regularly serve as a liaison to the local Chinese-language/focused media outlets to promote artists and events. Please refer to About CAAC for more details. "Sound of Spring: Yue Ju Opera"
Directed by the renowned female director from China, Wu Mei, Enter the Forbidden City will premiere in New York. Jia Zhang-Ke’s new film ASH IS PUREST WHITE will release in the U.S. on March 15th. A press preview will be held at CAAC with Jia's presence. CAAC co-sponsors with the Asian American Business Development Center with a new year celebration event. During the event, CAAC provides with the following performances: Lion Dance, Money God, and Sichuan Opera Face Changing. On November 17th, a Yue Ju Opera Performance will be held at Flushing Town Hall, Flushing, New York. Yue Opera, or also known as Shaoxing Opera, is the second most popular opera form out of over 360 opera genres in China. Originating in Shengzhou, Zhejiang Province in 1906, Yue opera features actresses in male roles, as well as femininity in terms of singing, performing, and staging. Chinese American Arts Council (CAAC) signed another year of agreement with Symphony Space's Global Arts Program, in conducting series of Workshop, Cultural Field Trip and After School Program on Chinese Opera and Martial Arts. 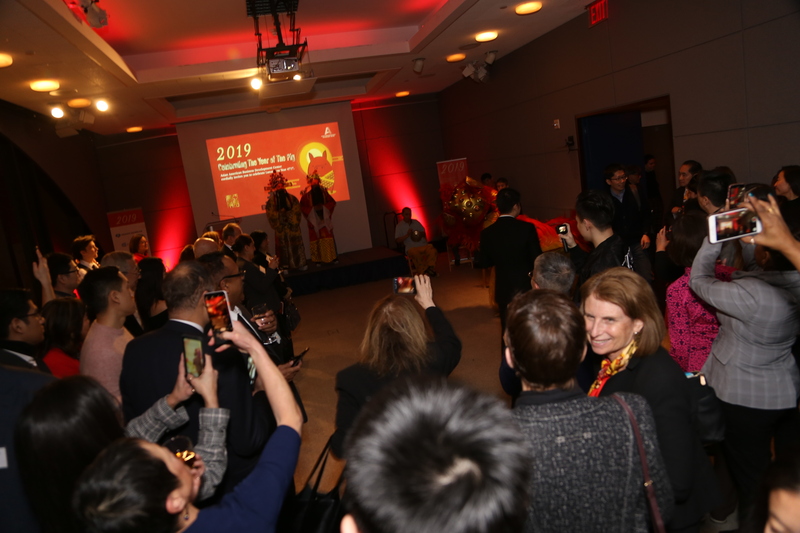 In this agreement, during 2018-2019, CAAC will conduct periodic workshops and demonstrations on Chinese Opera and Martial Arts at Symphony Space. Artists from CAAC were trained in China and who were stars of the Beijing and Shaoxing Opera Troupes. Recipients of numerous awards for their work in China, these artists specialize in warrior roles and are skilled in many styles of theatrical martial arts. Their performances and workshops introduce students and teachers to works from the Beijing, Shaoxing, Kun and Cantonese Opera repertories. Teaching artists perform and discuss the five elements of traditional Chinese opera—singing, talking, acting, fighting, and tumbling--with students, providing a deeper understanding of the discipline. An exploration of these elements elicits interactive discussion, learning the five elements in the Mandarin language, and practice with stage fighting skills, movement, and mime. On August 12th, a Peking Opera Concert will be held at 136-57 37th Ave, Flushing, New York. The Peking Opera Concert is a rare chance to witness a group of elite performers from the Yu Lineage of Peking opera. Yu lineage specializes in Lao-Sin Character of Peking opera, with almost hundred years of history and influence. On August 5th, the 18th Peking Opera Festival will be hosted at NYU Skirball Center, New York. The Peking Opera Festival is presented by Qi Shu Fang Peking Opera Company and co-sponsored by Chinese American Arts Council in New York. This year the festival will feature Zhang Ker, a country level first class opera actor in China and the principal actor from Shanghai Peking Opera Company, Xi Zhong-Lu, who is considered the very top Wu-Shen actor in the country. Lower Manhattan Cultural Council (LMCC) announces its application cycle for the 2019 Manhattan Arts Grants supporting arts projects across all of Manhattan. LMCC’s grants are available to support Manhattan-based artists and arts organizations working in any discipline to share artistic projects and programming with Manhattan audiences and participants. Supported activities include concerts, performances, public art, exhibitions, screenings, festivals, workshops, readings, and more. Creative Engagement grants provide support to individual artists and organizations to engage and enrich the public through the arts. Often a launching pad for emerging artists and organizations working across disciplines, these grants respond directly to the need for financial support of artists living and working in Manhattan and to the richness and diversity of arts programming they offer across the borough. Creative Learning grants support Manhattan’s teaching artists and small arts organizations that provide opportunities for in-depth, community-based arts education and enrichment to participants including youth, adults, or seniors. Both programs award public funds provided by the New York City Department of Cultural Affairs, and State funds, provided by the New York State Council on the Arts (NYSCA). Funding is intended for artists and organizations that are not able to apply directly to the City and/or State for arts funding. The application deadline for both programs is Tuesday, September 18, 2018 at 5:00pm. A first-time Chinese opera adaptation of the novel "Gone with the Wind" by American writer Margaret Mitchell. The proposed project is a full-length production of the Peking opera "Gone With the Wind." This is a play we have been excited to adapt to Chinese Opera for a long time because we believe that many of the themes - strong will, love, fantasy vs. reality, loss, change and survival - are universal human themes that lend themselves well to our dramatic medium. We are foregoing our usual traditional Chinese play this year in the spirit of sharing experiences and cultures in a divisive time. Tong Xiao Ling Chinese Opera Ensemble consists of a core group of actors and actresses who have worked together on many previous projects, accompanied by additional professionals as needed. Peking opera roles are not interchangeable in the sense that an individual spends decades training in order to properly portray an "old man" or a "clown." The saying goes, "every 10 minutes on stage takes 10 years behind the scenes." Due to the demanding nature of roles requiring not only vocal mastery but often martial arts and perfect stage movements and hand gestures, we only work with professionals actors with made decades' of experience because they have trained since childhood. The year of 2018 is the 20th year that Nianbo has been performing Peking Opera on the stage. In order to celebrate this landmark in Nianbo’s art career as well as to present audiences a high-quality Peking Opera Music performance, a Jinghu Concert, will be held on May 19, 2018 at 7pm, in Gerald W. Lynch Theater (524 West 59th Street, New York, NY 10019).